In Rukavina family lore my paternal grandmother Nettie is famous for the distance she would walk to save money. From her house on Mary Street in Brantford she would walk to a Callbeck’s grocery store far across town to save 45 cents on a tub of yogurt. And think nothing of it. She came of age in the Great Depression, and habits forged there she never broke. And these are habits she passed to my father, who, in turn, passed them to me, albeit with some withering away of the more extreme elements in each generation. And so when it came time to find a way from Calgary International Airport to my hotel across town this afternoon, I wasn’t looking for the fastest or most elegant way of traveling, I was looking for the cheapest way. I could have taken a taxi ($40-45, says the airport). Or an airport shuttle ($15). 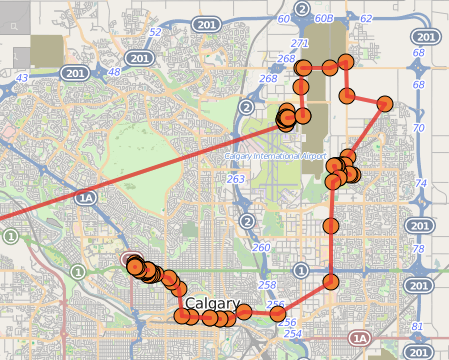 But my eye was immediately drawn to Calgary Transit, which could do even better. Option number one, which would take about an hour, involved bus #300 and the light rail line and would cost $8.50. Option number two would take about 90 minutes, via bus #100 and light rail, was only $3.00. As you can probably imagine, I opted for the $3.00 solution. Except that as I was standing in front of the ticket machine at the airport, the man at the machine beside me asked if I was looking for a ticket for the #100 bus, and when I told him that I was he offered me the one he’d just purchased, as he’d decided to take the quicker, more expensive route. So I ended up getting to my hotel for free. Nettie, I hope, would have been proud. From the placement and lack of signage pointing the way to public transit, it appears as though the airport hasn’t wholly embraced this transport option. The Calgary Transit information desk, for example, was staffed by someone who seemed completely unskilled at giving directions. And the desk is located at the opposite end of the airport from the bus departure bay, meaning that rather than following the signs for “ground transportation,” you actually go the opposite direction. Even the bus driver himself seemed to treat my presence grudgingly. But, that all said, it worked: the bus #100 goes to the McKnight-Westwinds light rail station, and from there it was an easy train ride downtown, a quick transfer, and a ride out toward the University of Calgary on the other light rail line. 90 minutes after setting out, I was happily checking into my hotel. Written October 5, 2014 at 10:46 p.m. I always take the bus from the airport when I'm in Ottawa. I think it's even faster than a taxi, and you can't beat the price - about $3.50. I always take the bus/subway in Toronto. Usually as good as a cab most of the day. Have yet to try in Calgary as family/friends are only too willing to drive to the airport. I thought the Calgary transit signage was good last time I was there, but being a former resident I knew what to look for and knew they had recently improved from having absolutely not signage in the terminal.